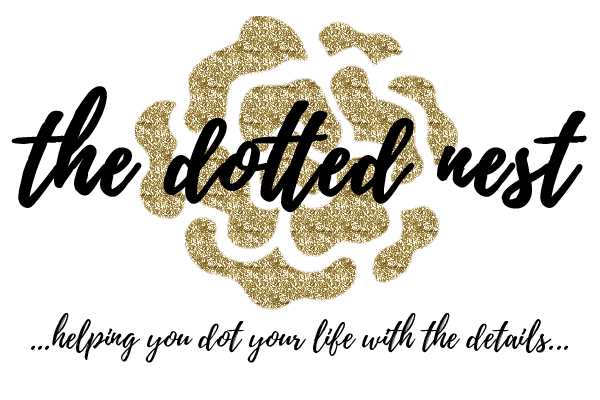 It's time for Favorite Dots Friday! Because the dots make up the details of life...but what exactly is "Favorite Dots Friday", you ask? Well, I thought it would be fun to put together a list of things I'm crushing on for the week or the month. I don't get to shop with friends very often anymore since being a mom is kind of time consuming, and if you've ever dragged kids on a shopping trip you know how much fun that can be. But we can make lemon-aid out of lemons right? Favorite Dots Friday might just be the next best thing. I know, I know. Admit it. When you hear the word "Farmhouse" you immediately think of that show on HGTV, don't you? The one that EVERYONE is gaga and googly-eyed over, right? The show that you'd be willing to sell your current home for, and move to a teeny tiny town in Texas if you could just have them help you make it over. Which show am I referring to? Fixer Upper, of course! It's hands down my favorite thing to watch on TV currently (and has been for the past 2 years). The show I will shush everyone over and give out iPad privileges left and right so I can just have 60 minutes to watch in peace and quiet. If you're like me and can't get enough of shiplap, Chip and Jojo, or the magic of magnolias, you might like reading about it! Right now you can purchase a full year's subscription to Magnolia Magazine at an amazingly discounted price (almost 40% off through this link!). Trust me, this is not a deal to pass up. Mother's Day will be here before we know it, and this would make a great gift! Farmhouse style pillows for (mostly) under $5.00?! Yes, please! (If you have Prime, shipping is free on a lot of them). Pillows are an easy way to add a little quick and easy style to your home. I think this one is my favorite...or maybe this one? Perfect to throw on the couch or your bed...especially if you're a pillow person like me and must have a lot of fluff around you when you're sitting or lounging. Windmills! Have you noticed that they are ALL over the internet and in boutiques right now? Pretty much if you're going to be on-trend with the Farmhouse thing, you need to somehow incorporate a windmill. I just love the texture they add to wall decor...especially if it's rusty and has a good patina on it. This one is a steal that won't break the bank. Wouldn't it look great if you added some chalky finish paint to it? Hmmmm...that might be an upcoming DIY! Farmhouse Style metal cafe chairs...I have been crushing on these particular chairs for awhile now. I love that they're counter height since our dining table is the higher style table (like this one). The mint/aqua color is my favorite! I really like that they are easy to clean too, which is kind of a must have with kids. There's always a spill at every meal. I should put that on a dishtowel or a t-shirt. Ha! The price is good also, especially since you get FOUR chairs for that price! We only have 4 chairs with our table...that was one thing I regretted...not buying extra chairs when we purchased our table. It has a big pull out to make it a large dining table, but we only have 4 chairs! Now they are no longer available and we can't order any that match. I think I might end up ordering a set of these to mix and match in though. 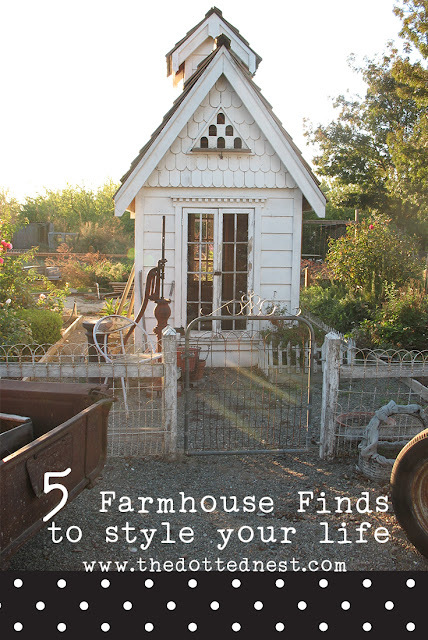 I'm not sure how "farmhouse-y" this is, but we'll go with it's "farmhouse chic". It's one of my favorite things this week anyway! Drinking coffee out of an adorable mug makes your coffee taste even that much better (if that's even possible? ), plus it's fun to look at your delicious coffee in an adorable mug. I firmly believe it can help start your day off in a positive way. Especially when you've been up multiple times a night with sick kids and have to start your day on very little sleep. Drink ALL the coffee! I got this mug at Walmart of all places. Confession: I never really shopped at Walmart much before we moved. I was definitely a Target girl. But now that Target is a good 20 minute drive away, and Walmart is literally only 5 minutes down the road...the convenience factor usually wins. Back to the mug...It has a nifty little lid similar to this one to help keep spills to a minimum 'cause no one wants to waste a drop of that precious caffeinated liquid gold. I wouldn't call this a travel mug, but since it has a lid you could take it with you in the car so you can finish drinking every last drop. PS: This is my favorite coffee in the entire world. It's nice and strong, exactly how coffee should be! I discovered it from the The Pioneer Woman a few years ago, so I'm classifying it as "Farmhouse Coffee". Hey, it works! Have fun dotting your nest! 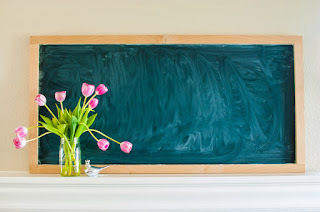 If you enjoyed all of this Farmhouse Style goodness, you might also like this Farmhouse Style Chalkboard DIY.